After 17 years as Landesvorsitzender of the Bayerischer Trachtenverband, Otto Dufter has chosen to retire. At the elections conducted at the Trachtenverband’s Jahresversammlung (Delegates Meeting) today (Sunday, Sept. 25), Max Bertl of the Oberer Lechgauverband was chosen to be Otto’s successor. Max Bertl of the Oberer Lechgauverband was elected to the office of Landesvorsitzender. He has a long resume of work within the Trachtenbewegung as well. Whether as one of the three representatives working with Otto for many years, as 1. Vorstand of the Oberer Lechgau and now Ehrenvorstand, or as an officer in his home Verein, Max is well suited for his new responsibilities. Many of us in Gauverband Nordamerika have met Max either at our Gaufeste here or at events in Bayern. The 65-year-old from Wildsteig is an energetic and likeable man who will surely fulfill the responsibilities of his new office with success. 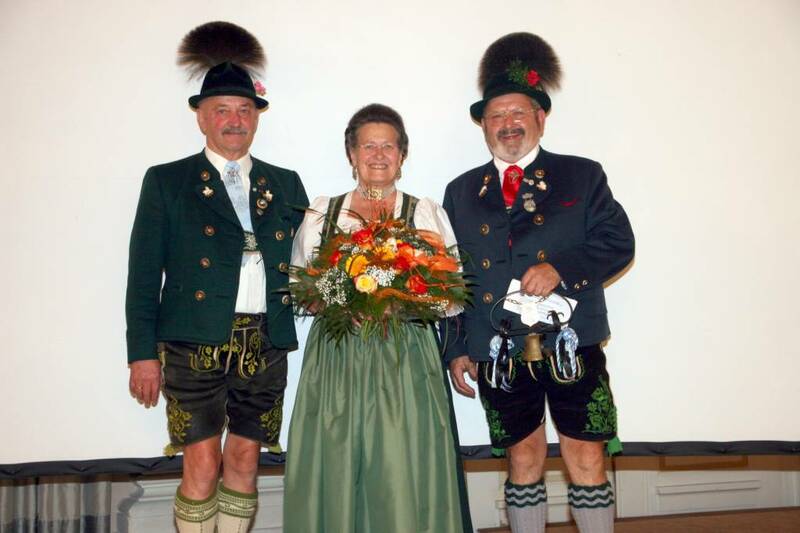 Elected to be the representatives of the Landesvorsitzender are Renate Koch of Oberfranken (the first woman ever to serve in this capacity), Peter Eicher of Gauverband I, and Andreas Tax of the Bayerischer Waldgau. Hildegard Hoffman (Isargau) continues as 1. Schriftführer, Hans Greil (Bayerischer Waldgau) as 2. Schriftführer. Walter Weinzierl (Bayerischer Inngau) and Klaus Reitner (Gauverband I) will serve as 1. and 2. Kassier. The Trachtenverband is the umbrella organization for 22 Gauverbände, 823 Heimat- und Trachtenvereine, and members numbering over 163,000 adults and almost 100,000 youth.